"If more people could read or write, we could be much closer to solving so many other problems that our country faces," Bush, who died Tuesday, once said. Former first lady Barbara Bush was remembered Tuesday as a fiercely loyal wife, mother and advocate who devoted countless hours to advancing literacy in the United States. Bush, who died Tuesday at age 92, highlighted "the importance of literacy as a fundamental family value that requires nurturing and protection," President Donald Trump said in a statement issued by the White House. "She will be long remembered for her strong devotion to country and family, both of which she served unfailingly well." Former President Jimmy Carter and his wife, Rosalynn, said "countless families now have the knowledge and skills they need to thrive in all aspects of their lives" thanks to Bush's decades of work to promote literacy. "She will be missed," the Carters said in a joint statement. 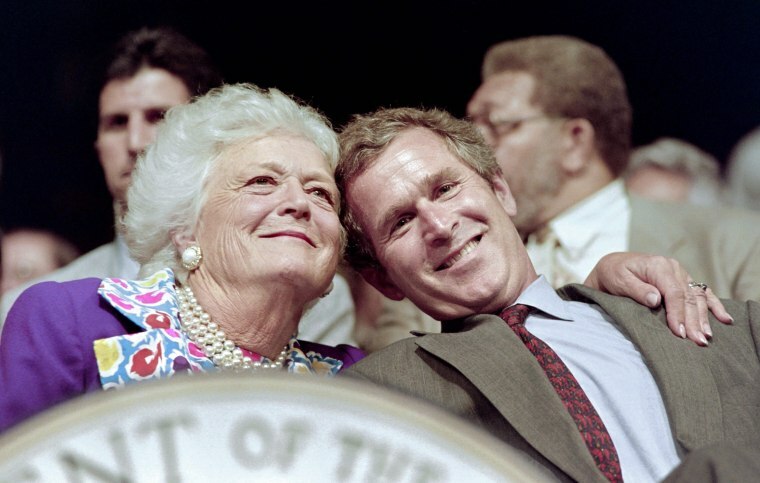 Bush became a passionate advocate for literacy during the 1980s as statistics indicated that millions of adults couldn't read above a fourth-grade level, the office of her husband of 73 years, George H.W. Bush, who was president from 1989 to 1993, said Tuesday. For the rest of her life as her health allowed, Bush tirelessly unveiled billboards, visited Head Start classes, supported alternative school programs for at-risk students and showed up for public events to champion the cause. "If more people could read or write, we could be much closer to solving so many other problems that our country faces," the Barbara Bush Foundation for Family Literacy, which Bush co-founded in 1989, quoted her as having said. Former President George W. Bush, Bush's son, called his mother "a woman unlike any other who brought levity, love, and literacy to millions." Likewise, James Baker, who was secretary of state and White House chief of staff during the administration of George H.W. Bush, remembered Barbara Bush on Tuesday as "a passionate voice for volunteerism and the view that everyone should believe in something larger than self." "Barbara Bush challenged each of us to build a better world by empowering people through literacy," Baker said. In a statement, Baker sounded another consistent theme: Barbara Bush's loyalty and dedication to her sprawling family. "As only one of two women in American history who can be called First Lady and First Mother, she was matriarch of a family that remains as dedicated to public service as it was to politics," he said. Another son, former Florida Gov. Jeb Bush, said in a statement: "I'm exceptionally privileged to be the son of George Bush and the exceptionally gracious, gregarious, fun, funny, loving, tough, smart, graceful woman who was the force of nature known as Barbara Bush." Former President Bill Clinton, who defeated George H.W. Bush in the 1992 presidential campaign but became close with the Bushes after he left the White House in 2001, said Barbara Bush was "fierce and feisty in support of her family and friends, her country and her causes." "She showed us what an honest, vibrant, full life looks like," Clinton said. "Hillary and I mourn her passing and bless her memory." Former President Barack Obama and his wife, Michelle, said in a joint statement that Bush's life was "a testament to the fact that public service is an important and noble calling" and "an example of the humility and decency that reflects the very best of the American spirit." "She'll be remembered for passing those American values on to her children, her grandchildren, her great-grandchildren — and to the countless citizens whom she and George inspired to become 'points of light' in service to others," they said.